Have you ever made an impossible pie? Their popularity came about in the 1970's-80's, with recipes were printed on the back on Bisquick boxes. They're so easy, and make for a quick pie. You can even make your own baking mix, if you'd like, and I have one on my blog, or you can just used a boxed baking mix. How about enjoying a slice today? I've used my giant polka dot teapot planter for some decoration, that's planted with my shamrock plant. I'm using another of my late great Aunt Kitty's painted plates and teacups. Isn't this a pretty design? I wonder if painted china is still being done? This is a quick and easy (lazy) pie, which can be eaten warm or cold. Preheat oven to 350 degrees. Grease 9-inch pie plate with shortening or cooking spray. In blender, add all the ingredients, except for the coconut. Blend on low until mixed, for about 3 minutes. Pour into pie plate, and let stand for 5 minutes. Sprinkle the coconut on top of the pie. Your Impossible Coconut Pie looks delicious, Kitty. Love the pretty design your Aunt Kitty painted on this teacup, saucer and plate. My goodness, your Aunty Kitty was a clever porcelain painter! Yum, I love coconut pie, it's one of my favorites! What a sweet and dainty handpainted tea set,so pretty!That coconut pie looks delicious.Hugs! I remember Impossible Pies - I used to make a savory taco one. Your Aunt Kitty was very talented and how lucky you are to have some of her hand painted teacups. Impossible not to eat! This looks and sounds delicious! Love the teacup! So springy!!! Have a nice week Kitty! This is the first time I've heard of Impossible Pies. I love all things coconut so your pie would definitely be up my alley. 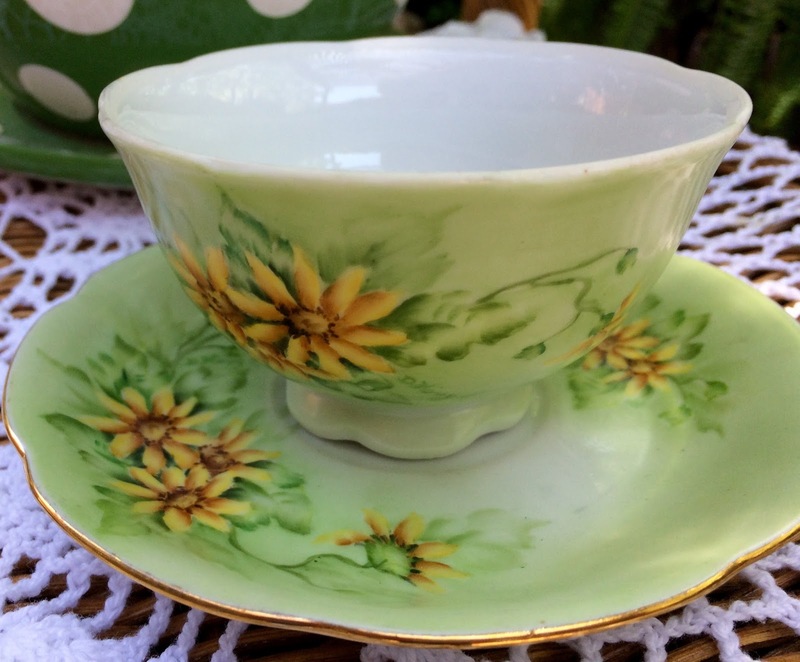 Your Aunt Kitty's handpainted teacups are so pretty! oh YUM - I absolutely love coconut pie - and I need to try this recipe! As always, thanks so much for sharing your tried-and-true recipes with us, Kitty. You're the best. Hugs! Oh yeah, the bisquick impossible pies were always in rotation at our house when our boys were growing up. We all loved them. My husband loved the impossible chicken and brocolli pie, and the boys were especially crazy for impossible taco pie!!! Personally, the coconut pie is my favorite and I still make it now and then even though it's just my husband and myself to cook for. Thanks for reminding me of this yummy dish! When I lived in FL, our development had "glass painting" classes, but they weren't as beautiful as the ones your Aunt Kitty made! I wish there was a place where we could go do that. Bisquick now makes a gluten free mix & I think I'll try making your *impossible pie* with it for next weekend's event at my GF brother. I'll have a regular one made as back up, too, for those who don't need GFree. Thanks for sharing the recipe & your pretty treasures. BTW, I FINALLY found the TAZO teas you shared...had to order then online & pick up from Target. Thanks for telling me/us about them! Yummy! Oh Kitty, that does look and sound so good...and SO very easy! I just may throw one of these together for Jim...coconut pie is one of his favorites! I think the painted china is so beautiful. I'm sure a few of the teacups I have that were given to me by my MIL are hand painted but I don't know their history. Yours are so very dear to you because your Great Aunt Kitty painted them...such precious keepsakes! Have a blessed week! Sometimes quick and easy is just the thing! I've never tried making one of these, but, boy, it looks so yummy! 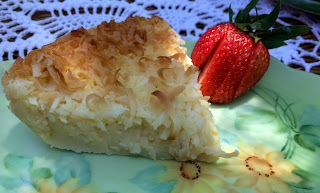 Coconut cream pie was my dear, sweet Mom's favorite...I always think of her when I see one. I hope all is well with you today, sweet friend. Praying for you. Dear Kitty: Yes, I have made this before. Last Saturday I had 3 ladies over for lunch and I made 2 salads, a main dish and dessert all with recipes from the l970's. It was very funny as 2 of ladies were my age but the lady who was 47 hadn't heard of some the dishes of course! I love your pie and growing up Coconut Cream Pie was always my choice! Thanks for sharing Kitty! 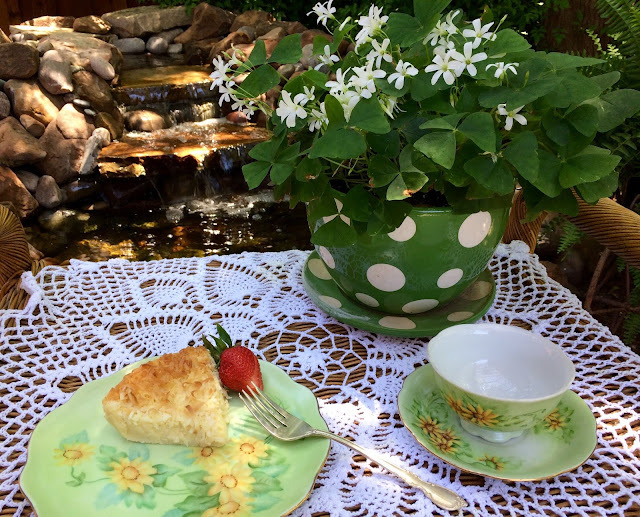 Love your Aunt Kitty's painted china -- precious memory, too. Oh my goodness, we used to always make Bisquick biscuits, for years, but never did we try their pie recipe! It sounds wonderful! Plus, I wanted to share with you....that my Aunt has been painting on china dishes for years. She belongs to a group who does it together, from her church. All her work is quite lovely! Kitty, your pie looks lovely! I make my own version of this that results in a shallower pie, leaving room for a load of whipped cream. But I love the look of your deeper one and so think I'll increase my amounts a bit to make it look like yours. I'd love to have a piece right now on Aunt Kitty's plate! Oh Kitty, this looks and sounds so good!! I made an impossible quiche a few months ago, and I liked it. I think maybe Hal still prefers the traditional style of Quiche Lorraine, but I liked both ways. I saw another impossible pie recipe for egg custard pie on Pinterest earlier today. I love your Aunt Kitty's painted china; it's just so pretty and unique. What a treasure for your to have. :) I'm envious of your shamrock plant; I used to have such pretty ones at our home in Greensboro, but I haven't had any luck with them here. Maybe I should try again. I hope you have a great weekend, Kitty!! I've never made an Impossible Pie before, but when my Grandmother moved to Florida, she cleaned out her whole house and gave me her recipe collection and she had tons of recipes for different kinds of Impossible Pie. I will have to try one some time. I love this pie, Kitty. Your Impossible Coconut Pie looks so easy and so delicious,inspires me to go to the kitchen and make one this very minute. Hope you are having a great week and thanks so much for sharing with us at Full Plate Thursday! This is definitely an easy pie to make...I haven't had it in ages. You know until I started this Keto diet I wasn't a big coconut fan. Now I can't get enough. This looks delicious. Hi Kitty, I'm sorry I missed your posts while I was away, I'm slowly trying to catch-up with what everyone has been up to. I love this pie recipe and it's a keeper. I will make it soon, sounds delicious for summer. You certainly did receive some pretty pieces from your Aunt. The teacup is lovely. I love your shamrock plant in the pretty planter. I still have mine and I need to plant it. Still need to catch up in the house and garden. Thanks so much for your visit. With bloggers changes I've always replied to you in my Email but they don't come in with the changes. Still trying to figure out how to stay in touch. Oh my!!! I LOVE anything coconut and yes... do love the "impossible pies". My mom used to make the cheeseburger pie all the time. I've tried some of the dessert pies but haven't seen this one before. Definitely trying! That pie made me come over like a fly, lol.. Thanks for sharing sweet friend and that teacup is adorabke. Nothing better then a cuppa with Coconut cake ! Pinning. Your baking is incredible. I love cocoanut pie so I should try this. Today! Thanks for linking to Keep In Touch.